In ambulatory pulse wave monitoring, the peripheral blood pressure, the central hemodynamics, and the arterial stiffness are automatically measured over a period of 24 hours at an interval that can be freely adjusted. This can be used to create a hemodynamic day/night profile. 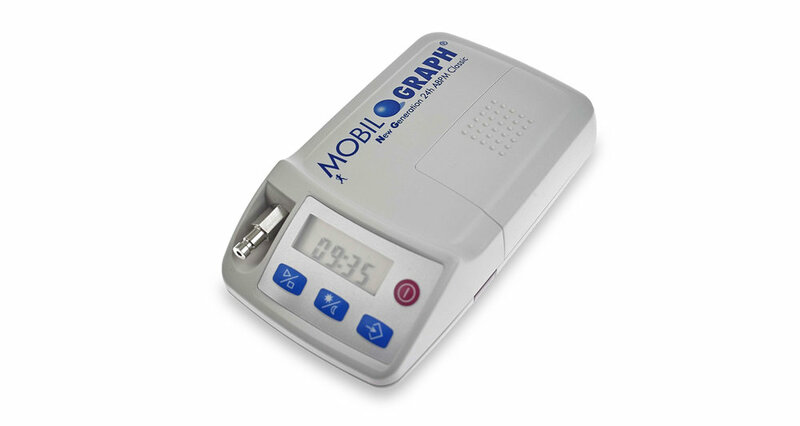 The “Mobil-O-Graph” basic ABP monitor set which analyzes the pulse wave form enables the pressure curve to be wirelessly transferred to the HMS CS analysis software. In addition to the blood pressure values, all information about the central aortic pulse wave is analyzed. The auto-feedback logic causes a smooth adjustment to the patient’s individual blood pressure response. This means that the patient is not unnecessarily stressed (e.g. by a high level of pumping in the cuff). The measurement times are being significantly shortened. The monitor functions using the oscillometric method. The supplied software is suitable for treatment data transfer and is network-compatible. The patient’s ability to sleep through the night is significantly improved by gentle blood pressure measurements with individually adjusted pumping. Quick, wireless transfer of the measurement values to the physician’s computer. Highly diagnostic graphics, early morning increase in blood pressure, comparative profiles. Documenting and saving all long-term and self-monitored blood pressure data in the HMS CS evaluation unit with interfaces for the physician’s office and clinic management system.